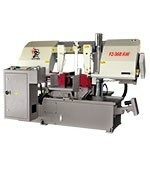 Lesther Column type full automatic bandsaws for cutting beams, pipes & solids. 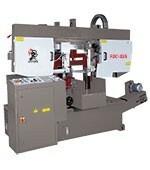 Lesther Column type full automatic bandsaws for cutting beams, pipes & solids. Delivered with an automatic chip conveyor. 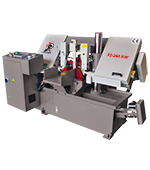 Delivered with an automatic chip conveyor, our Lesther F2-460AW is fitted with an independant roller feed bed and vice system which prevents any contact on the side of the material to be cut. 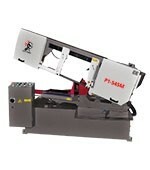 The Lesther P1-350M is a miter sawing machine which can cut at any angle between 90 ° and 45 ° (30 °) left and equipped with an hydraulic vice system. The Lesther P1-450M is a miter sawing machine which can cut at any angle between 90 ° and 45 ° (30 °) left and equipped with tungsten carbide and roller guides. The Lesther P1-545M is a miter sawing machine which can cut at any angle between 90 ° and 45 ° (30 °) left and equipped with the full stroke of its hydraulic vice. 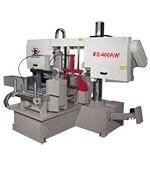 Model: F2-260 / F2-360 / F2-460 / F2-600 Semi-automatic column type bandsaws for cutting beams, pipes & solids. 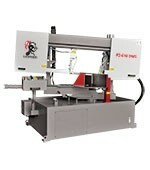 The Lesther P2-610DMS is a column type semi-automatic sawing machine for double miter cutting and beam cutting. 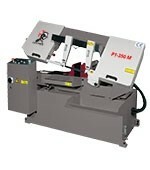 Equipped with Computer Numerical Control (CNC), this sawing machine helps reduce the initial blade impact when cutting beams by tilting the bandsaw blade 4 degrees. The Lesther P2-650DMS is a column type semi-automatic sawing machine for double miter cutting and beam cutting. 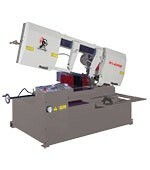 Equipped with Computer Numerical Control (CNC), this sawing machine helps reduce the initial blade impact when cutting beams by tilting the bandsaw blade 5 degrees. Discover our complete range of bandsaws and cutting machines for wood and metal. We offer automatic sawing machines , semi-automatic bandsaws , Manual sawing machines , CNC , horizontal, vertical , miter and columns type sawing machines. Our LESTHER sawing and cuting machines and equipment establishes themselves as leaders by offering a great flexibility and productivity during your operations and by allowing a total control of your production. Looking for performance? You want a reliable bandsaw with a good quality/cost ratio? We have the one your factory needs. 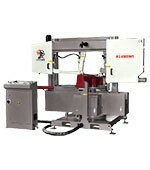 We offer a wide range of bandsaws and cutting machines in world-renowned brands such as Bianco. From small cutting machines to heavy-duty bandsaws, they have been designed and equipped with modern technology. Our team will choose in our wide range of product the perfect equipment to meet your factory's unique requirements. Our mission is to improve the performance of your production while keeping your workers safe. 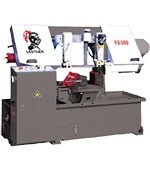 Each machine is chosen carefully in order to meet your metal cutting needs. Our team has a varied set of skills and expertise, which us to stand out by offering complete turnkey solutions and quality technical support to our clients.